Born of cooperative brain storming by aerodynamicist, Tim Gibson, and BME President, Bill Miller, the Gibson/Miller Supercharger takes an evolutionary rather than a revolutionary approach to improving performance of superchargers used on large displacement V8 racing engines. Tim Gibson, a UCLA graduate aerodynamics engineer was formerly with Hughes Aerospace, then spent five years as the Aerodynamicist for John Force Racing and, also, drove the BME Dragster back in the late-90s. Bill Miller is President of Bill Miller Engineering, Ltd., the manufacturer of the Gibson/Miller Supercharger, owns the BME/Okuma/Red Line Oil Top Fuel Dragster and is the only independent in Top Fuel racing who regularly qualifies at NHRA National Events. The Gibson/Miller Mark II Supercharger is catching on. 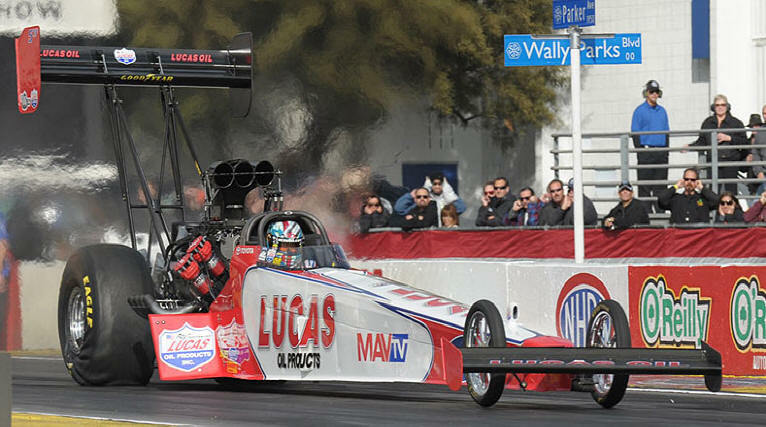 In 2010, John Stewart, Crew Chief for the Lucas Oil Top Fuel car driven by Shawn Langdon, switched to the Gibson/Miller Mk II . The results were immediate. The lighter supercharger combined with its greater air flow improved performance dramatically. Other, more recent converts to the G/M Mk II are Top Fuel racer, Allen Hartley, as well as Funny Car veteran Jim Dunn. Image: AutoImagery. In the early '90s, racers in the nitro classes tried to raise the blower technology bar several notches, but the National Hot Rod Association wasn't buying. With its risk management minions whispering in its ears, NHRA outlawed both screw-type and high-helix, Roots-type superchargers putting their potential for significant performance increases out of reach. Observing NHRA's rule-making, but seeing a clear need for a better blower, Gibson and Miller took a different route to that end. They retained the traditional, General Motors, 71-series, Roots supercharger architecture but refined its layout, materials and manufacturing processes. Consistency is the mother's milk of drag racing, so the the goal of Gibson's and Miller's efforts was a supercharger which performs more consistently over a longer time. Gibson's work focused on improvements which allowed more air flow through the blower. This involved changes to the blower case as well as to the rotors. Of course, more air means you can use more fuel and burning more fuel makes more power. Click the arrow to watch a test of a Gibson/Miller Mark II Supercharger. In this video, hosted by Bill Miller, you'll learn more about the special engine dynamometer BME uses to test superchargers. A Gibson/Miller Supercharger case is machined from a large, magnesium alloy casting. The task takes about a day in the BME Supercharger Department's Okuma, five-axis, CNC, Machining Center. Image: BME, Ltd.
One of the headaches in blown-fuel drag racing can be high wear rates exhibited by supercharger parts, particularly the rotors' Nylatron apex seal strips. Most blowers don't control rotor and case flexing very well and the resulting fluctuations in rotor-to-case clearance cause rapid and inconsistent seal wear. "Restripping the blower" is a frequent, repetitive, labor-intensive, maintenance task. Because the rotor seals were so limited in durability, getting consistent supercharger performance is a lot of work and quite costly, but, even after all the hassle and money, can still be a crap-shoot. The front line teams in Top Fuel and Funny Car racing have dozens of blowers they frequently change and an employee who's only job is to restrip them. The little guys either constantly work on their blowers or live with the inconsistency. As a nitro class independent running on a limited budget, Bill Miller knew well this "catch-22" of supercharger consistency. Because he couldn?t afford the dozens of blowers owned by a big team and his smaller crew was hard-pressed to do constant rotor seal work; he decided to investigate what caused superchargers to eat-up seal strips quicker than politicians burn-through your tax money. 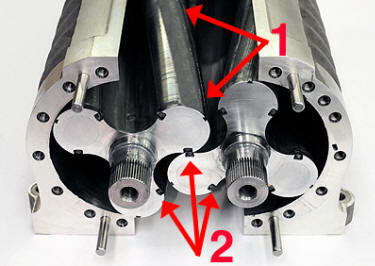 Each rotor lobe has an apex seal (1) made of Nylatron and two side seals (2) made of carbon-impregnated Teflon. These strips seal off the cavities formed by the rotor lobe and the blower case, preventing the air trapped inside the cavities from leaking away and reducing the supercharger's efficiency. Before the Gibson/Miller Supercharger was developed, in a blown-fuel or blown-alcohol drag racing duty cycle, the durability of these strips was poor and their reliability was inconsistent. As consistency is the mother's milk of drag racing, apex strip maintenance was a chronic problem. Image: BME, Ltd.
A standard-helix rotor set for a 14-71 Gibson/Miller Mark II. They are designed to be more rigid than other supercharger rotors. They accomplish that goal through more robust structure, improved materials and more precise manufacturing. This investigation took Gibson and Miller to the heart of a supercharger: its rotors. They found rotor seals to be unreliable in a dynamic sense because their rotors twist and flex so much. That unwanted movement caused the rotor clearance to fluctuate wildly. When it was too tight, the seals were chewed-up very quickly. When it got too loose, the blower's efficiency tanked due to leakage. Gibson and Miller designed rotor improvements aimed at significantly reducing twist and flex and increasing the system's tolerance for whatever flexing couldn't be eliminated. Additionally, the blower case and end frames were stiffened, compared to those of other superchargers. Lastly, aerospace-grade materials were used along with the precise manufacturing process controls which have made BME an industry quality benchmark. The result of this design and development project was the 1996 introduction of the Gibson-Miller Supercharger, the most efficient, reliable and durable Roots blower available for any large V8, racing application. The Gibson/Miller blower was quickly embraced by top competitors in nitro class drag racing for its outstanding quality, increased air flow and most of all it's consistency in performance. It remained in production for several years. 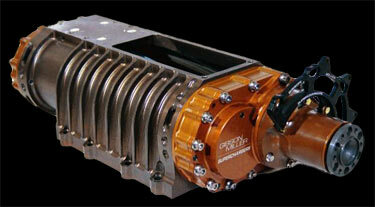 Thirteen years ago, the first-design Gibson/Miller Supercharger was a landmark product. It was a case where blown-fuel drag racers got improved performance, consistency and reduced maintenance costs. 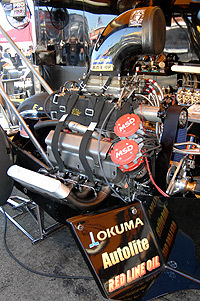 Image: BME, Ltd.
By 2004, the performances of the BME/Okuma/Red Line Oil Top Fuel dragster and those of the BME Team's competitors made it obvious that other supercharger manufacturers' products would soon reach parity in performance with the Gibson/Miller. Additionally, engine development since the late-'90s in nitro class drag racing had reached the point where even the Gibson/Miller blower was nearing its performance limit. 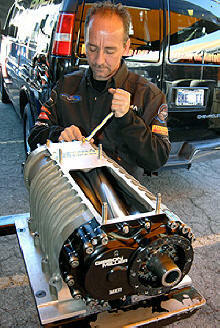 During 2005, Tim Gibson and Bill Miller began developing a follow-on to their blower. After an extensive development and test program which took a little over three years, the improved, Gibson/Miller Mark II Supercharger debuted in January 2009. It incorporated a number of changes based on Bill Miller's eight years racing the first version of the blower on the BME Dragster and an exhaustive dynamometer testing program, part of which you can watch in a video near the end of this article. 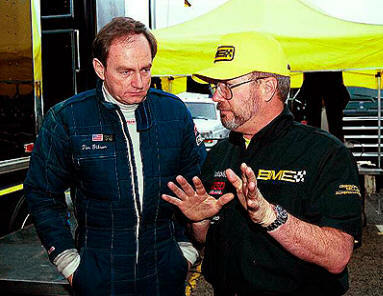 BME President, Bill Miller, and Troy Buff, Driver of the BME/Okuma/Red Line Oil Top Fuel Dragster, discuss a prototype Gibson/Miller Mark II at the Winternationals in Pomona, California in February of 2008. 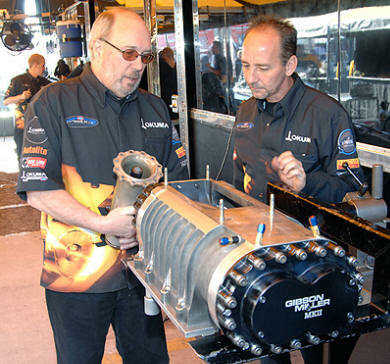 Image: BME, Ltd.
Tim Gibson (the airflow engineer, left) and Bill Miller (the development, manufacturing and testing engineer, right) have partnered to produce the best supercharger for big-bore V8s in drag racing and other motorsports. Image: BME, Ltd. The majority of the Mark II enhancements further improved supercharger durability and consistency. The first big improvement was a switch from all-magnesium construction to a more rigid combination of a magnesium case and aluminum end frames. Gibson and Miller's analysis and testing showed that even though aluminum's approximate 30% increase in stiffness over "mag" comes with a modest weight penalty, the result would be a net gain because the additional rigidity would enable even more consistent sealing and improved seal life and the weight increase contributed only a modest amount to the total package weight. Additional airflow development done by Tim Gibson resulted in changes to the inlet side of the blower case and the shape of the rotors themselves to improve flow through the supercharger at high rotor speeds. According to numbers gained through testing on BME's "Blower Dyno", the Mark II is capable of a 10-12% improvement in airflow over the first Gibson/Miller blower which already had noticeably better airflow than its competitors. At a rotor speed of 12500 rpm, a Mark II flows an astonishing 3750 cubic feet of air per minute. The Mark II continues Gibson/Miller's track record of making the most efficient, reliable and durable supercharger available to nitro class drag racers. Troy Buff, who's duties on the BME Crew also include supercharger inspection and maintenance, has a lot less to do than the blower specialists on teams not using the Gibson/Miller. Typically, Buff inspects the inside and outside of the blower, then reinstalls it. Image: BME, Ltd. In a Top Fuel application, such as this 500-cubic inch Brad Anderson Hemi, the Gibson/Miller Mark II holds airflow consistency within 1% for typically eight but as many as 10 runs down the drag strip. Image: BME, Ltd. 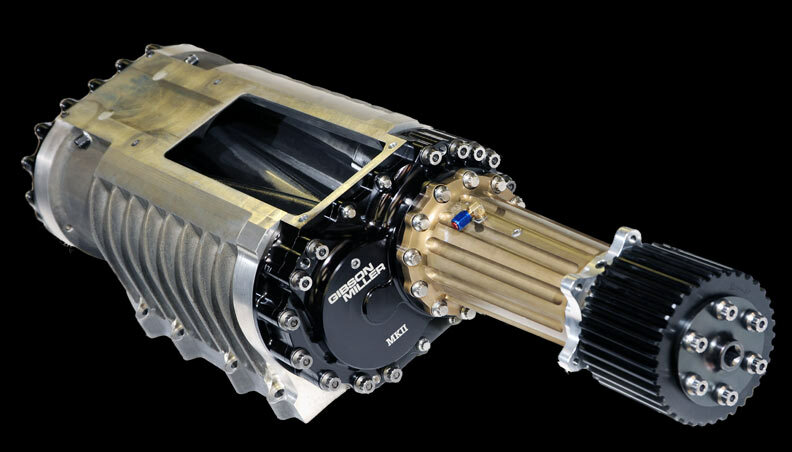 The Gibson/Miller Mark II delivers the highest airflow, the greatest boost, the best efficiency and the longest durability of any Roots-type supercharger used in a racing application. Saying that a supercharger has "high efficiency" is merely marketing flimflam if a blower can only achieve those characteristics for one or two passes down the drag strip. The Gibson/Miller is designed to perform run after run after run. In a Top Fuel duty cycle, Mark IIs remain consistent to about 1% in airflow for 6-8 passes. In blown-alcohol or blown-gasoline applications the durability can be a dozen passes. The Gibson/Miller Supercharger was designed using state-of-the-art, Computer-Aided Design and Computer-Aided Manufacturing (CAD/CAM) systems. 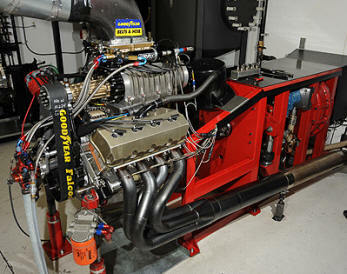 That allows BME to make the most technically advanced supercharger available for big V8s burning gas, alcohol or nitro. 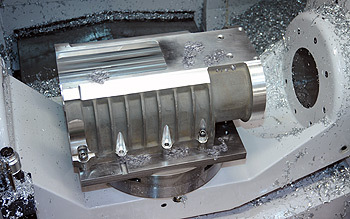 The Gibson/Miller Mark II Supercharger case is machined by BME's skilled workforce using an Okuma, MU-500VA-L, five-axis, computer-numeric-controlled (CNC) machining center from a rough casting of magnesium alloy. The blower's end frames are CNC-machined from aerospace-quality, aluminum plates. These CNC'ed components have more consistent wall-thickness and higher yield-strength than the magnesium or aluminum castings used by other supercharger makers. These parts provide maximum stiffness with minimum weight. This rigidity helps maintain the supercharger's precise clearances over a longer time and the result is more consistent performance. 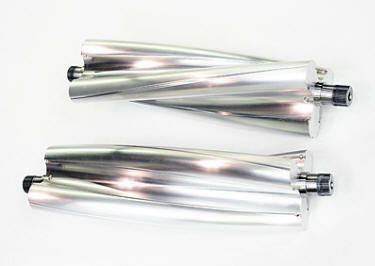 A Gibson/Miller Mark II's rotor shafts are 12 times more rigid than those used in other drag racing superchargers. This increased stiffness better resists rotor deflection resulting from over 7,000 pounds of force exerted on them by the 60-psi manifold pressure in a blown-fuel drag race engine. Special, high-speed, low-friction front and rear gear drives have zero backlash for very-accurate rotor timing. The rotors are indexed to .001". Precision spur gears eliminate axial thrust and case deflection produced by the helical gear systems on other supercharges. Unlike other blowers, the gear cases are sealed, not only to keep the oil in but, also, to keep blower pressure out, using a unique double-lip rotor shaft seal. Keeping blower pressure out of the gear cases results in improved response because, when the driver stands on the gas leaving the starting line, manifold pressure increases more quickly and reaches a higher level. One "secret" of the Gibson/Miller Mark II Supercharger is the precision with which its parts are manufactured at BME's factory in Carson City, Nevada. This sequence shows one of the Gibson/Miller's end frames being machined in the Okuma five-axis CNC Machining Center operated by BME Supercharger Production Manager, Russell Findley. First, the part is chucked in the mill. Then, machining starts. During the process, measurement of the rotor bearing bores is checked. More machining is done. After the part is complete, it is thoroughly cleaned then is black-anodized. Finally, it is moved to the blower assembly area. 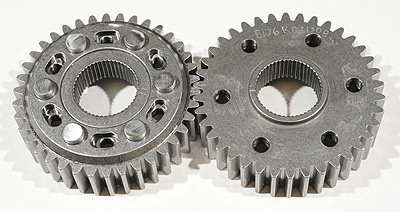 Images: BME, Ltd.
Each Mark II has two sets of gears like this which allow the rotors to be indexed as close as .001". The gear at the left (the driven gear) is a two-piece assembly with a vernier adjustment system. During manufacturing, indexing is adjusted, then steel rivets are installed through the slots and holes to lock the adjustment. Image: BME, Ltd.
ARP fasteners are used exclusively during Gibson/Miller Supercharger assembly. The capscrews and other hardware are specially designed to provide the correct elongation and clamping force required by the magnesium case and the aluminum endplates. With its magnesium cases and aluminum endplates laid-out with CAD/CAM and the highly accurate CNC machine work used in their manufacture, the Gibson/Miller Mark II is the lightest, most durable, three-lobe-rotor, four-gear supercharger available. A complete assembly weighs a little less than 86 pounds, 10 pounds less than other superchargers used in blown-fuel applications. 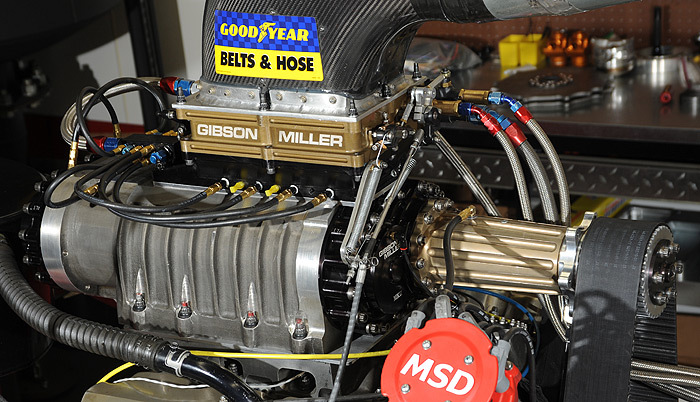 A Gibson/Miller Mark II 14-71 Supercharger "locked-and-loaded" on BME's Blower Dyno and dressed for use on an alcohol-burning, 500-cubic inch, drag racing Hemi. The BME Blower Dyno was a key tool in the Mark II's development and is used to validate the performance of each Gibson/Miller Mark II just before it is delivered to a customer. Image: BME Ltd. The Gibson/Miller Mark II is the only supercharger which has been tested and validated on a dynamometer using a test engine capable of subjecting a supercharger to the loads and stress it would sustain in drag race competition. Bill Miller Engineering operates the world's only engine dynamometer capable of putting full load on racing engines generating up to 8000 horsepower. This engine dyno was originally built by famed nitro class Crew Chief, Dale Armstrong, when he worked for former NHRA Top Fuel and Funny Car Champion, Kenny Bernstein during the 1980s and 90s. After Armstrong left King Racing in 1997, the dyno sat in Bernstein's shop until Bill Miller bought it in 2004. Miller and the engineering staff at BME refurbished the power absorption unit and it's 4:1 gear reduction system, added contemporary electronic controls and a modern data acquisition system and built a facility to house the equipment which includes a giant pair of mufflers to deaden the sound of the test engine. Each Gibson/Miller Mark II Supercharger is performance-tested on the BME Blower Dyno before it is shipped to a customer. Bill Miller, at left, is personally involved in each Supercharger test run as the dyno test engineer. Image: BME, Ltd. Image: BME, Ltd. The BME Blower Dynamometer was built specifically for use during development of the Gibson/Miller Mark II Supercharger. Nowadays it's used for both continuous improvement and to validate the performance of each Supercharger before it is shipped. Image: BME, Ltd. The engine used to test the blowers is a Top Fuel engine modified with higher compression ratio, a single magneto and a blown-alcohol fuel pump. It burns straight methanol rather than an 90% mix of nitromethane and methanol. The reason for straight alcohol rather than nitro is the cost, complexity and engine durability problems typical of supercharged, nitromethane burning race engines. Running the test engine on alcohol makes the blower testing more consistent and the resulting data more accurate. With a Mark II installed, this engine produces 2020-hp@7100-rpm and 1580-lbs/ft torque at 6500 rpm. During 2007 and 2008, the Gibson/Miller development staff spent countless hours testing, developing then retesting the Supercharger on this dyno. The result is the Mark II's improved performance, reliability and durability. Originally developed for supercharged, nitromethane-burning drag race engines, the Gibson/Miller Supercharger has excellent performance potential for offshore powerboats and other endurance racing applications. It also is good for monster trucks, Bonneville, tractor pulling, dry lakes racing or any application requiring a Roots-type blower capable of high-performance, excellent consistency, rock-solid reliability and long-term durability. In addition to the original, 14-71 size, the Gibson/Miller Mark II is available in 12-71, 10-71, 8-71 and 6-71 sizes all with either standard or high-helix rotor sets. The Gibson/Miller Supercharger is manufactured by Bill Miller Engineering, the leader in forged aluminum connecting rod and forged aluminum piston technology. 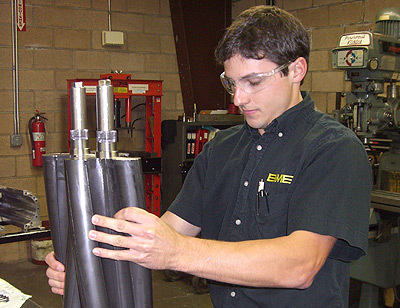 BME has built its reputation on service, integrity, and engineering excellence. BME not only sells but, also, services the Gibson/Miller Supercharger. BME prides itself on quick turnaround of blowers sent in for maintenance or repairs.